HP's storage results sank 5 per cent year-on-year in its latest quarter due to declining EVA array and tape product revenues. CFO Cathy Lesjak said in the earnings call: "In Storage, the continued strong performance of 3PAR with more than 60 per cent growth and StoreOnce with double-digit growth did not offset the decline in EVA and tape revenue. External disk revenue was flat year-over-year, and total Storage revenue was down per cent year-over-year. " EVA is HP's long-standing mid-range modular disk drive array, which occupies a position in the market not available to HP's acquired 3PAR drive array technology, which is used to build larger and faster arrays generally. 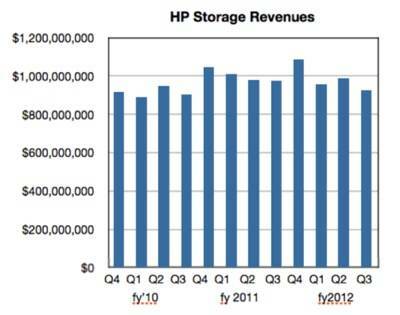 HP pulled in $924m from its storage products, which compares to $990m in the previous quarter and $976m a year ago. A chart of its quarterly storage revues shows pronounced seasonal patterns and a possibility that storage revenues for this fiscal year could be lower than those last year. Lesjak did not mention the P4000 iSCSI array business, nor the high-end P9000 XP arrays, OEM'd from Hitachi, nor the IBRIX scale-out filers. Like Dell with its bought-in EqualLogic iSCSI array technology, HP is not seeing much growth from its bought-in P4000 (LeftHand) iSCSI array technology. The all-flash version may change that.